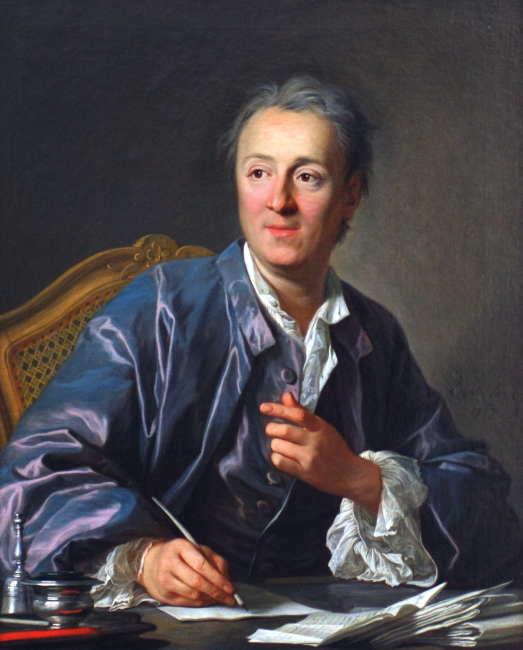 On July 31, 1784, French philosopher, art critic, and writer Denis Diderot passed away. Diderot is best known for serving as co-founder, chief editor, and contributor to the Encyclopédie along with Jean le Rond d’Alembert. He was a prominent figure during the Enlightenment. Denis Diderot was born on October 5, 1713, the second oldest child of the wealthy Jansenist master cutler Didier Diderot from Langres (Haut-Marne) and his wife Angélique Vigneron. From the age of 12, his parents prepared him for the priesthood. On 22 August 1726 he received the tonsure from the Bishop of Langres and thus the lower ordinations. He now had the right to call himself an Abbé and to wear spiritual clothing. Diderot was first admitted to the Lycée Louis-le-Grand in Paris, then moved to the Jansenist Collège d’Harcourt, graduating in 1732 as magister artium. He failed to join the planned theological studies, but completed his studies at the Sorbonne on 6 August 1735 as bachelor. From 1736 Diderot worked as a paralegal. When he gave up this post in 1737, his father stopped making regular financial contributions. Diderot now lived four years on writing commissions, so he wrote sermons for clergymen and worked as a tutor for a rich financier, while learning English. The young Diderot led the life of a bohemian. It was a time of chronic shortage of money. 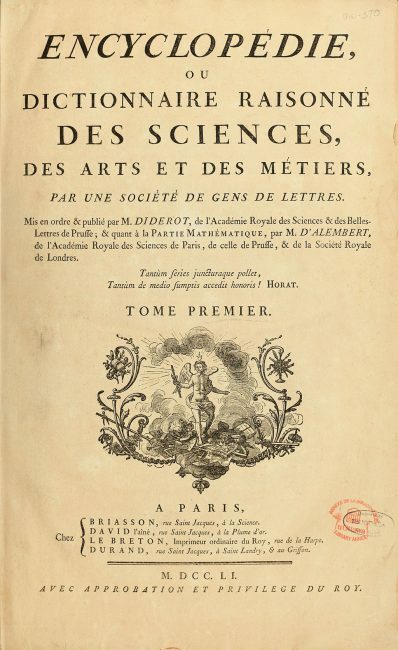 Diderot was enthusiastic about the theatre but he was also very interested in mathematics, so he met the mathematician and philosopher Pierre Le Guay de Prémontval and attended his lectures in 1738. Diderot later took on translation activities from English into French and learned English using a Latin-English dictionary. In 1742 he translated the Grecian History of Temple Stanyan. In 1745 Diderot also translated Shaftesbury’s Inquiry concerning Virtue (Essai sur le mérite et la vertu). Shaftesbury’s ideas strongly influenced the French Enlightenment. For Diderot, the aversion to dogmatic thinking, tolerance and moral based on humanistic ideals were particularly important. 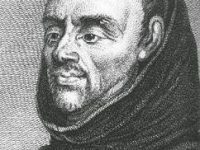 Diderot read with great interest Michel de Montaigne’s essays. In these years Diderot made friends with other young intellectuals such as d’Alembert, Abbé Étienne Bonnot de Condillac and Melchior Grimm. Diderot continued to associate with Parisian intellectuals, at Café Procope, also at Café Landelle. At the Café de la Régence at the Place du Palais-Royal, Diderot regularly played chess. 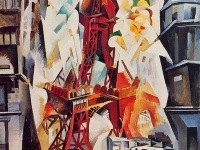 He was friends with François-André Danican Philidor, the best player of his time. André François Le Breton, a bookseller and printer, had originally thought of a pure translation of the British Cyclopaedia, or Universal Dictionary of the Arts and Sciences, published in 1728 and edited by Ephraim Chambers. In April 1745 Le Breton applied for a royal printing privilege for a multi-volume work translated into French, the Encyclopédie, which was granted on 21 January 1746 and Denis Diderot was to become her translator. Jean-Paul de Gua de Malves was initially entrusted with the organizational management. In 1747, however, he gave up his participation in this project and Diderot took over his function. In 1747 Diderot took over as editor of the Encyclopédie, initially together with d’Alembert, and from 1760 with Louis de Jaucourt. Designing the overall plan, winning authors and organizing their collaboration to fight printing privilege and censorship, and also writing more than 3,000 articles yourself, has been work for years. Where necessary, Diderot expanded its field of knowledge. From 1754 to 1757 he regularly attended the chemistry lectures of Guillaume-François Rouelles. During this time Diderot also wrote novels and stories, plays for the theatre, worked on a theater theory and epistemology. Much of this was initially not published, but some of it has already been made public by transcription. Despite all this work, Diderot participated in the lively social life of philosophes – the critical Parisian intellectuals such as Condillac, Turgot, Helvétius and d’Holbach – as well as visiting noble salons. Since the winter of 1752/53 he also had contact by letter to Madame de Pompadour, who according to Marc-Pierre d’Argenson’s journal had made contact with the encyclopedists in 1752. Later she received some of them, including Diderot, for informal dinners and discussions. In July 1765, Diderot completed work on the Encyclopédie. He and his family had lived on payments from publishers and booksellers for almost 20 years, and he had no rights to royalties. Only income from his father’s inheritance came from Langres. Dmitri Alexeyevich Golitsyn and Grimm saved the situation. They arranged the sale of Diderot’s library to Catherine II of Russia – it was transported to St. Petersburg after his death – for 16,000 livre. In addition, Catherine II paid him 1000 livre per year throughout his life as librarian of his own library and provided him with money for new acquisitions. Between October 1773 and March 1774, the sick Diderot spent a few months at the empress’s court in Saint Petersburg. Diderot’s library entered (like the Voltaires) the Russian National Library, founded in 1795. 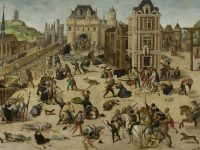 At the centre of Diderotian thought was the field of tension – and this may also apply to other thinkers of the 18th century – between reason and sensitivity, sens et sensibilité. For Diderot, reason was characterised by the search for scientifically founded findings and the verifiability of empirically observed and proven facts, without remaining stuck in the purely quantitative recording of reality, in mathematical statements. In the years 1754 to 1765 he developed the doctrine of universal sensitivity, sensibilité universal. For Diderot, science was characterized by the fact that it should not ask for a why, but for the question of how to find an answer. He worked in many fields of knowledge, including chemistry, physics, mathematics, but above all natural history, anatomy and medicine. 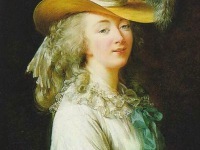 In July 1784, upon hearing that Diderot was in poor health, Catherine the Great arranged for him to move into a luxurious suite in the Rue de Richelieu. Diderot died two weeks later of pulmonary thrombosis in Paris on 31 July 1784, and was buried in the city’s Église Saint-Roch.